Wanna make money off referrals? 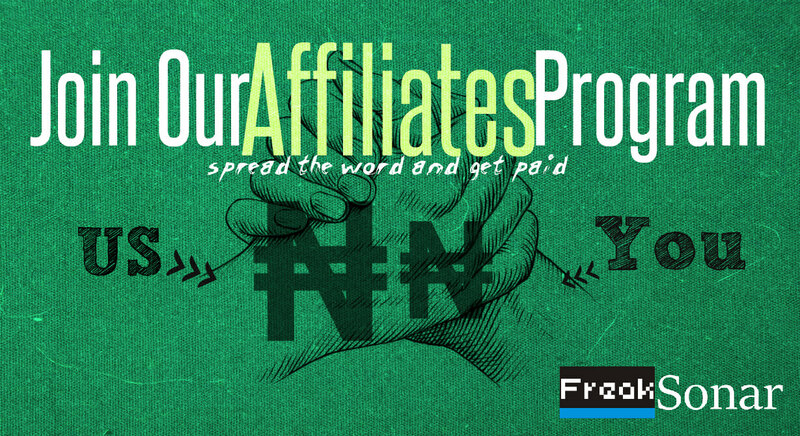 Join the FreakSonar Affiliates Program Today. FREAKSONAR AFFILIATES PROGRAM : How does it work? When a new user clicks your referral link, and purchases a beat / product or service from our Afrobeat Store / Product Store, you will receive 20% of that person’s purchase price. You make money, We make money….. Both Of Us Remain Happy!! If they purchase a beat / product or service worth ₦20,000 .. you get ₦4000 Commission. If they purchase a beat / product or service worth ₦15,000 .. you get ₦3000 Commission. Register and fill in all the required details. For Gmail Account Users, Check your Spam Box For your Login Details. You will find your unique link in the “Creatives” section on your dashboard when you log in. The minimum amount for payout is ₦30,000. (You need to have earned at least ₦30,000 to get paid). We pay directly to Nigerian Bank Accounts, So if you are in Nigeria, fill in the complete and accurate details of your bank account when registering. (Don’t have a Nigerian Bank account?? fear not.. We also pay via western union / moneygram). Don’t Have an account with us yet?? Visit our Affiliates Dashboard page now to get started.